Bring your friends to our Kihei nail shop for a pedicure party or give a Beauty Spa Maui pedicure gift certificate to a friend. 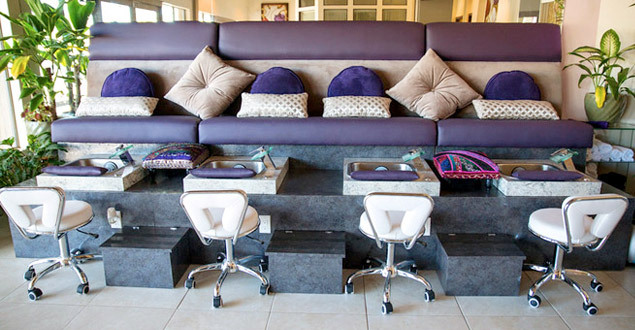 Beauty Spa Maui invites you to unwind with a Maui pedicure package in Beauty Spa Maui’s custom lush pedicure bench. Drift away with our massaging whirlpool foot bath while you enjoy the aroma of our custom-blended soaking salts. Followed by a nail trim to perfection, shaping, and gentle buff of the nail plate. Our organic foot scrub is made on premises featuring a light exfoliation in combination with a relaxing massage of our oil-infused body butter. You will leave feeling relaxed and rejuvenated. Beauty Spa Maui Manicure services – Your nails are carefully trimmed, shaped, and lightly buffed of any imperfections. Your cuticles are softened and treated to a hydrating oil infused body butter, finished with a polish of your choice. Beauty Spa Maui offers gel nail extension services. From your elegant pink and white, or our individual custom color and glitter nails. We provide an abundance of nail art services for any occasion. From plumeria flowers to 3D jeweled art our nail artists will provide you that special, unique, or abstract look. We use only top quality OPI products for use. Please feel free to call for specific pricing nail art services.